While the fish treatment and storage center ceased production in the 1980s, seafood is still celebrated at Hotel Brosundet's acclaimed Maki Restaurant. With an emphasis on the freshest local seafood, Maki's menu changes every month to accomodate seasonal offerings. 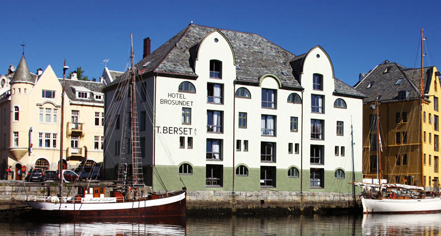 Hotel Brosundet, a charter member of Historic Hotels Worldwide since 2012, dates back to 1904. 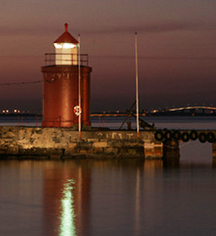 At Hotel Brosundet, guests can stay inside the Molja Lighthouse. Pet Policy: Service animals allowed: Yes. Pets allowed: Yes. Dogs Only. Fee: Please contact hotel. A restored fishing warehouse, Hotel Brosundet is a Art Nouveau escape combining a charming nautical design with contemporary fixings complete with a converted lighthouse suite. Learn more about the History of Hotel Brosundet .